Motorcycle crash victims in Florida are often entitled to substantial compensation. Motorcycle crash injuries are incredibly severe. Riders are twenty-eight times more likely to die in a collision than vehicle occupants. Even if the riders survive, the road to recovery is long and winding. Moreover, Florida personal injury attorneys often obtain significant compensation because, although every case is different, they are all rather predictable. Insurance companies keep trying the same defenses, and for the most part, they keep failing. The compensation in a motorcycle crash usually includes money for economic damages, such as medical bills, and noneconomic damages, such as pain and suffering. Additional punitive damages may be available as well, in some extreme cases. In roughly a third of motorcycle crashes, the inattentive tortfeasor (negligent driver) pulls directly into the path of an oncoming motorcycle. Typically, the tortfeasor is attempting a left turn across traffic, does not see the rider, guns the engine to shoot through a gap in traffic, and smacks into the motorcycle. These kinds of crashes often give rise to the last clear chance defense. This doctrine applies in other kinds of Florida car wrecks as well, such as rear-end and head-on collisions. 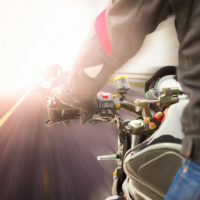 Essentially, if the rider has a reasonable chance to avoid the collision but does not do so, the rider, and not the tortfeasor, is legally responsible for the crash. Attempts to avoid the collision include things like changing lanes or stopping suddenly. Basically, a motorcycle rider cannot see a crash coming, do nothing, and blame the other driver. These attempts are difficult in a four-wheel vehicle, especially if there is other traffic on the road. Such efforts are basically impossible on a motorcycle, even if the weather is good and there is no traffic. Bikes are much harder to control than four-wheel vehicles. As a result, the victim often has the last possible chance to avoid a collision, but not the last clear chance. There is a difference. Florida’s comparative fault doctrine is usually the next line of defense. But insurance company lawyers have an even harder time winning this argument. Contributory negligence essentially means multiple fault. This loophole often applies if, for example, the victim changed lanes illegally and the tortfeasor was speeding. Typically, emergency responders only issue one citation in a car wreck case. This policy makes it easier for the insurance company to assign initial fault to one driver or the other one. So, in contributory negligence claims, the insurance company must use circumstantial evidence or shaky witness statements. Therefore, the argument is on an unsteady foundation. Anything the insurance company tries to add on is shaky as well. Florida is a pure comparative fault state. At best, the doctrine only reduces the amount of compensation the victim receives. Even if the victim is 99 percent responsible for the crash, the victim still receives a proportional share of damages. If the insurance company has no legal defense, its lawyers often use the motorcycle prejudice to poison jurors against the victim. Insurance company lawyers portray the victim as a reckless motorcycle rider who pulled out in front of a car. Many Florida jurors share this opinion about bikers in general, so they are willing to apply it to the victim in particular. The motorcycle prejudice is not as strong as it was in the 1970s and 1980s, so it’s easier for a Florida personal injury attorney to diffuse it. Many times, the best approach is to bolster the victim’s credibility and thus indirectly attack the prejudice. Insurance company lawyers often try to use legal loopholes in motorcycle crash defenses. For a free consultation with an experienced Brandon motorcycle accident lawyer, contact Reed & Reed. We have four area offices (St. Petersburg, Lakeland, Tampa, and Clearwater).